South-eastern foothills of the Manhartsberg at the municipality Zöbing in the wine-growing region Kamptal (NE). The survey is located only by the Riede grub separated, in the neighborhood of the famous Zöbinger Heiligenstein, On the Gaisberg is a homonymous, oriented to the south-southeast Riede (Location). This consists mainly of weathering rock with brown earth deposit. In the upper part there is Terraces systems on prevailing mica schist soils. In Austria this is often referred to as "rock bottom". 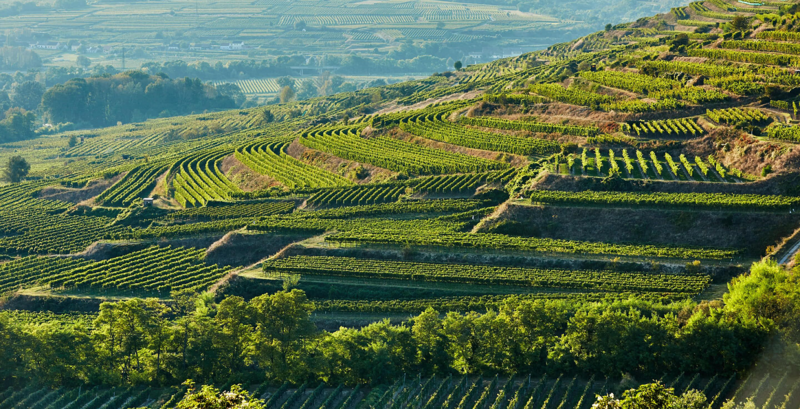 The lower, eastern area has a sandy loess cover and is partly frost- and threatened by drought, On the Gaisberg are mainly the white wine varieties Green Valtellina. Riesling, and Neuburger cultivated. Shares in the Gaisberg have, for example, the wineries Allram. Arndorfer. Dolle Peter. Eichinger Birgit. Hiedler Ludwig. Stag Johannes. Laurence V.. Castle Gobelsburg. Schreibeis. Pot Johann. Weixel tree Heinz and Zottlöderer, In the lower part of the Gaisberg there is the Ofenberg vineyard, which is characterized by a loess-covered soil and its microclimate. This is virtually predestined for the Grüner Veltliner. Worth seeing is a here Kellergasse with many very old vaulted cellars, some of which serve only as display objects. This page was last modified at 21 September 2017 at 10:37.